Christian Walton: 7.5 - Keeper made an absolutely crucial stop just after the break, turning Amond’s low shot on to the post as a second could have seen Town staring at defeat. Hugely unlucky with opener too, with his fine reaction stop counting for little as the rebound was converted. James Justin: 8 - Getting more impressive with every passing minute he tightened up his defensive duties with some excellent interventions. Always had the legs to get forward too, with Luton searching for a leveller. Dan Potts: 7 - His confidence continues to rise with a proper run in the team now and delivered another assured display as part of Town’s incredibly young back-line. Akin Famewo: 8 - Some full debut from the 17-year-old, who looked cool, calm and collected for the entire evening. Comfortable in possession too and appeared nerveless throughout, which was some feat considering it was his first start in the Football League. Alan Sheehan (STAR MAN): 8.5 - Not many centre halves could have stepped up to curl such a magnificent free kick into the top corner. Looked back to something like his best too, bringing the ball out of defence to get the visitors going when Pools were down to 10 men. Olly Lee: 6.5 - Needlessly gave the ball away in dangerous position as Hartlepool took the lead on the stroke of half time. Kept Luton ticking as they enjoyed a monopoly on possession in the second period, and almost won it with a York-like drive from deep. Jake Gray: 6.5 - Up against his former side and put in plenty of work during the first half in which Hatters could never really get going. Made way just after the hour mark though as Luton bolstered their attacking options. Alex Gilliead: 6.5 - Deserving of a first start and made some good breaks at times in a first half where not a great deal happened. 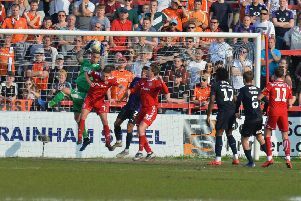 Trickery was more evident in the second period with Luton on top and minutes will have done him a world of good. Pelly-Ruddock Mpanzu: 8 - Surprised a few by starting in a striking berth alongside Marriott, but was involved in Luton’s best moments early on. Dropped deeper after the break and was a constant threat, hitting the outside of the post. Jack Marriott: 7 - Missed a glorious chance at the death which would have undoubtedly sealed victory for Hatters. Denied by a number of last-ditch blocks once more as although finishing is slightly off, continues to take up good positions. Isaac Vassell (SUB): 6.5 - Helped Luton stretch the home defence once more as the visitors left with a deserved point. Jordan Cook (SUB): 6.5 - Almost won it with a lovely curling effort that drew a fine flying stop from Carson.